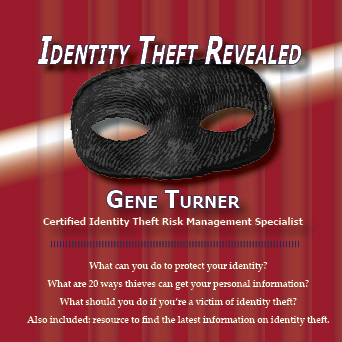 Need an entertaining and enlightening speaker that can talk about identity protection. Just ask Gene. Gene can provide your trade-show floor or speaking spots with traffic driving information and entertainment. Gene excels at pickpocket entertainment as one of the Midwest's most prominent magicians. Wonder what Gene has been doing lately? Check out his Facebook feed to find out. For more than 30 years, Gene Turner has thrilled, mesmerized and thoroughly entertained audiences with his speaking, training and infotainment using his unique blend of magic, humor, and outrageous pickpocket exploits. Gene’s ability to demonstrate how easily your valuables and private information can be compromised helps your attendees realize it can happen to them. Gene provides the tools you need to keep yourself safe at work, at home or on the road. Gene attracts more people to your booth in a fun, professional way gaining their attention and getting them to listen to your message. He will help qualify the leads and gets them turned over to your representatives. Turning your tradeshow exhibit into a compelling experience will help attendees remember your company and message long after the trade show ends. Gene is at the top of his field as a pickpocket entertainer. Gene developed the art of switching watches from one person to another without their knowledge. His performances include original material, sleight of hand & flawless execution. Gene’s stage act is a brilliant mix of comedy, magic and pickpocket entertainment guaranteed to have you laughing and wondering, “How’d he do that?” His up-close magic and pickpocket demo/challenge is impressive because the audience is close enough to see there is no smoke or mirrors — just the magic of a distinguished professional. All of my current account buyers and new potential clients were amazed and entertained by Gene and his special brand of marketing. I say marketing because Gene can draw the client to the trade floor booth area, then proceed to pre-market each client with our company basic product offering and mission statement while showing our guests a terrific time [thus] creating a warm lead in for the attending sales rep to have a dialog and begin [or] extend relationship building. [Gene’s] stage presentation and mingling with the guests were performed in a friendly and humorous way while displaying the utmost in professionalism. At first we were a bit concerned how people would react to Gene “mingling” and performing up-close magic during our meal. We need not worry. Between courses, it seemed he would just appear, work his way from table to table, and people were laughing and having a great time. …if you are looking for a special interviewee for your station that will entertain you and your listeners, I HIGHLY recommend Gene Turner. Without exception, everyone who attended his performance [at our annual convention] was amazed not only with his sleight-of-hand but also with the presentation of his skills and sense of humor. It is not often that you see a large group of accountants all laughing at the same time!!! I’ve been in the security business for over 30 years, and I learn something new every time I hear him speak and watch him perform. Have a corporate event, trade-show or just need for a unique entertainment experience? Contact Pickpocket Gene about your show today!